Lock in a great price for South Ceylon – rated 9.1 by recent guests! Comfortable beds, super helpful and kind staff, great wifi, large and clean room, delicious homemeade breakfast. What can you ask for? Highly recommend! it's a quiet place & the staff are very helpful. we kept asking for multiple things and they always helped with a smile on their face. the owner has a car & he offers to drive you anywhere you need. i also asked for a late checkout and they gladly agreed since the room was not booked after my stay. South Ceylon Was a great place to stay in unawatuna. 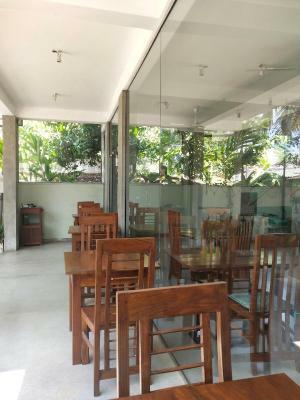 It is situated very close to the beach (100m) and very close to restaurants and shops. The staff were very friendly, especially Charith who was always on hand if you needed something. The breakfast menu was a real bonus as the food was excellent. I recommend the Mexican style omelette! The hotel was clean, comfortable and great value. Thank you Ceylon for a wonderful stay. This hotel has been the best we stayed at. Room was very big, just like our bathroom - perfect. Very friendly people, very good breakfast. Location is pretty silent and just a few minutes away from the beach. What a place! It’s still not finish yet and looks like a construction site, but what we experienced was above and beyond all our expectations! The staff was so friendly and helpful. He helped us with whatever we needed, and even called us after we’d checked out to see if we got to our next place safe. He attended to all our requests and made delicious food. The room was big and comfy, great space, very clean and bright room. The breakfast was really good and they even made vegan options for two of us! Best coffee we’ve had in Sri Lanka (we even got coconut milk for it!) Location is great. Our stay was very plessant. Good breakfast, a normal bed with musquito-net and proactive staff. The manager Charid was very helpfull, we would go again! Loved this guest house, we had a friendly welcome (Charith couldn't have been more useful) and a very clean, bright room with a balcony where we sat and watched the fruit bats coming in to roost at night. The funny thing about this place is that it isn't finished yet so coming out of our room looked as if it was on the roof but in time, other rooms will be there. For us it was in a great location, we loved the bohemian feel to Unawatuna and this was in the middle of that, It was about a 5 minute walk to the beach. Breakfast was great with plenty to fill us up. South Ceylon This rating is a reflection of how the property compares to the industry standard when it comes to price, facilities and services available. It's based on a self-evaluation by the property. Use this rating to help choose your stay! One of our best sellers in Unawatuna! South Ceylon features free WiFi throughout the property and views of garden in Unawatuna. The property is 350 feet from Unawatuna beach. All units in the hotel are fitted with a kettle. 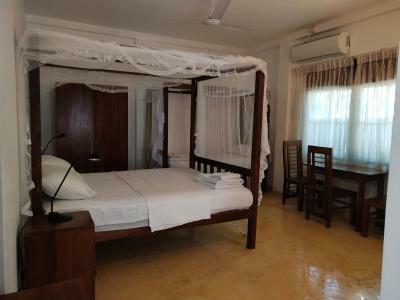 All rooms are equipped with a private bathroom and a bath or shower, and some units at South Ceylon have a balcony. The units will provide guests with a fridge. A vegetarian breakfast is available each morning at the property. The accommodations offers a sun terrace. Located around 0.7 mi from Japanese Peace Pagoda, the hotel is also 1.3 mi away from Yatagala Temple. The property has a restaurant and Galle Dutch Hospital is 2.2 mi away. When would you like to stay at South Ceylon? This triple room has air conditioning, electric kettle and tea/coffee maker. House Rules South Ceylon takes special requests – add in the next step! The beds were quite comfy and the breakfast which was included in the price was nice :) The location of this place is perfect as it's 3 minutes away from the beach. In the street where the place is located there are many different small restaurants and bars. The wifi was not working properly. However, the staff tried to fix it by bringing their own wifi to the hotel. (That worked some of the time). No complaints on the room. Good location. Very spacious and clean room. Easy getting to the beach. Helpful and friendly staff. The staff was very nice and friendly. We enjoyed our stay and it's a great value for the price. Breakfast was very nice and rich . This place was only a minute walk from the beach and placed in the heart of unawatunas main road where you could find restaurants, shops and everything else you need. The hosts were nice and the room was very clean and big. It was one of the expensive stays during our trip so maybe we expected a little more but actually everything was really nice. Breakfast was amazing value included in room price. Bed linen spotless. Great shower after booking out. Great location.